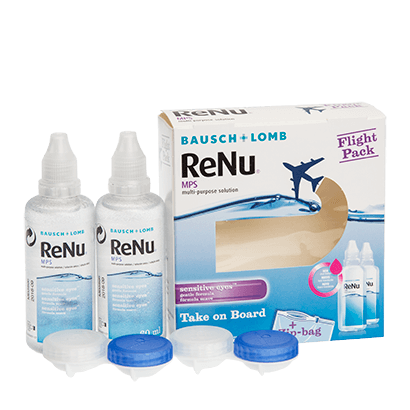 Travelling abroad with contact lenses is made simple with the ReNu Multi-Purpose Flight Pack solution, manufactured by Bausch & Lomb. This travel pack includes two lens cases and two 60ml bottles, to facilitate your eye care needs whilst jetting off abroad. The multi-purpose solution, from the ReNu range, is equipped to offer effective rinsing, lubricating and cleaning for your contact lenses. With a 1% Poloxamine make-up, the solution is applied to the contact lens to remove any build-up of lipids, micro-organisms or debris and to maintain its wettability. This means that with ReNu Multi-Purpose Flight Pack, you’ll experience a high level of comfort and incredible hygiene. ReNu Multi-Purpose Flight Pack can be used on all soft contact lenses and is even compatible with silicone hydrogel contact lenses. Enjoy this ultra-convenient travel sized bottle, which you can store easily in your hand luggage, whilst you’re on the go. If you’re not off on holiday anytime soon, then maybe a larger supply is what you’re looking for. In that case, FeelGoodContacts.ie also stock the 1-month pack, in addition to a further Bausch & Lomb range.